The Flow single rail stairlift is the market leader when it comes to curved stairlifts and is the smartest lift of its type. 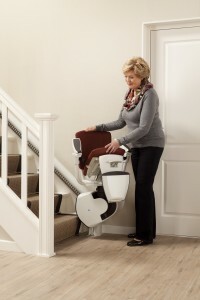 Flow is the only stairlift on the market which is capable of swivelling during the ride both up and down the stairs. This unique and patented feature makes the Flow stairlift capable of fitting most staircases, straight, around corners or even spiral. This compact stairlift looks simple on the outside but the technology on the inside is extremely ingenious. The angle of the staircase can vary from -70° up to 70°. The Flow curved stairlift has a seat which is ergonomically shaped to the user providing for a more enjoyable ride. The Flow stairlift is designed to be a feature of the home, rather than just a mobility product, the user can choose between three fabric colours, four vinyl, six elegant leather and three comfort leather to determine the best fit. The seat height is adjustable to five different positions when a powered swivel is used (set at installation), which means that Flow stairlift can be adjusted to suit a variety of users. Flow folds neatly for storage, using its linked seat to footrest mechanism, removing the need to bend and manually fold the stairlift.